Finding a reasonably priced, reliable and accommodating web hosting provider can be a daunting process. TopWebHosts.com provides the average web hosting consumer a reliable, informative and money-saving guide to help locate the top web hosting company for their current needs. By employing our strict evaluation guidelines, we search the web far and wide for our list of web hosting providers. These guidelines ensure only the most qualified and cutting-edge web hosts make it on the list. We then do a thorough evaluation of their company and rate them on numerous important features and services. 15+ years web hosting experience. 20+ years experience in the Internet industry. 15+ years management of a major online retail destination. 20+ years knowledge of the computer and software industry. 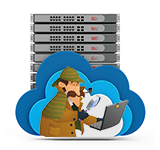 Ok, Ok, enough with the resume… Most importantly, our detective has the know-how and experience to critique and evaluate web hosting companies like few others can! That said, if you’re looking for a new web host, this is the quintessential place to check first. Even if you’ve already got a current web host, we just might have an even better web hosting offer to present to you, so check back often for the latest deals!